The Faculty of Languages and Translation held a poetry competition on Tuesday 8/11/2016. A large number of students from different faculties took part in the competition. 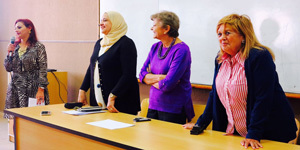 The panel was comprised of Prof. Nadia Touba and Dr Hoda Salem who handed out the prizes to winners in the presence of Prof. Leyla Kamel, the Faculty Dean and Ms. Rania Bassiouney, the student activities leader. The competition included poems in English as well as in modern standard and colloquial Arabic. Atef Alsisi- a student in the faculty of Physical Therapy. Mariam Ahmed- a student in the faculty of Languages and Translation. Marwan Soliman- a student in the faculty of Engineering. Mohamed Abdelhay- a student in the faculty of Physical Therapy.